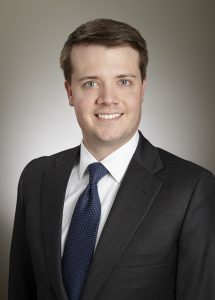 Andrew joined the firm in December 2017 after practicing for more than seven years with a midsize law firm in Atlanta. As a contract lawyer, he represents individual and corporate clients in all stages of civil litigation, and especially in contract, employment, land use, and other business disputes. He has appeared on behalf of both plaintiffs and defendants in state and federal trial and appellate courts, in arbitrations, and at mediations. At every stage, Andrew consults closely with clients to ensure that their cases are handled transparently, efficiently, and cost-effectively while securing the best possible results. Andrew was fortunate to marry into a family that has been active in the Bulloch County business, educational, and farming communities for several generations. He is licensed to practice in the State of Georgia, and he is also admitted to practice in the United States Court of Appeals for the Eleventh Circuit and the United States District Courts for the Northern and Middle Districts of Georgia, the Northern District of Florida, the Eastern District of Michigan, the Eastern and Western Districts of Tennessee, and the District of Colorado. Connecticut Addiction Medicine, LLC v. eLab Solutions Corp., Civil Action File No. 3:17-CV-0333-VLB, 2018 WL 379008 (D. Conn. Jan. 11, 2018) (prevailing on motion to transfer action to federal court in Georgia, where client’s principal office and manufacturing location were located, based on forum selection clause). Community & Southern Bank v. Lovell, — Ga. —, 2017 WL 4870998 (Oct. 30, 2017) (affirming the dismissal of most claims brought against judgment debtor’s wife and related companies under Georgia’s Uniform Fraudulent Transfers Act). West v. DJ Mortgage, LLC, — F. Supp. 3d —, 2017 WL 4278348 (N.D. Ga. Sept. 14, 2017) (granting, in part, motion for summary judgment filed by residential real estate leasing company as to claims filed by a former tenant under federal Fair Housing Act of 1968). BankUnited, N.A. v. TNP Enterprises, LLC, Civil Action File No. 3:16-CV-0031-TCB, 2017 WL 3531389 (N.D. Ga. June 30, 2017) (granting summary judgment to lender on claims related to defaulted secured commercial debt). Gwinnett County v. SHF Equestria, LLC, Appeal No. A17A0334 (Ga. Ct. App. May 16, 2017) (unpublished) (affirming summary judgment to the owner of a residential subdivision that, in connection with easement agreement, county waived charges and fees associated with client’s right to tap into subdivision’s water and sewer lines). Georgia Dermatologic Surgery Centers, P.C. v. Pharis, 341 Ga. App. 305 (2017) (reversing, in part, the summary judgment entered as to claims asserted by a dermatological surgeon and his practice against former colleague), oral argument available at http://www.gaappeals.us/oav/A17A0617-715.php (Feb. 13, 2017). Brock v. RES-GA SCL, LLC, 340 Ga. App. 194 (2017) (reversing orders that set aside and reentered orders that dismissed claims brought against judgment debtor’s wife and related companies under Georgia’s Uniform Fraudulent Transfers Act, thereby rendering judgment creditor’s attempted appeal untimely). Luxottica Group, S.p.A. v. Greenbriar Marketplace II, LLC, 212 F. Supp. 3d 1375 (N.D. Ga. 2016) (granting summary judgment to indirect, minority owner of an entity that owned retail property in which flea market operated as to contributory trademark infringement claims asserted under federal Lanham Trademark Act). Regions Bank v. Burgo, Civil Action File No. 1:15-CV-1426-MHC, 2016 WL 5340544 (N.D. Ga. May 12, 2016) (denying summary judgment to a lender on claims related to defaulted secured commercial debt). Atlantech, Inc. v. American Panel Corp., 743 F.3d 287 (1st Cir. 2014) (affirming decisions of district court following a multi-week jury trial, including that the plaintiff failed to prove direct damages resulting from an alleged repudiation of contract at trial and waived the claim for prejudgment interest). Atlantech, Inc. v. American Panel Corp., Civil Action File No. 07-10342-DPW, 2013 WL 870227 (D. Mass. Mar. 6, 2013) (post-trial dispositive decisions of district court in complex commercial contract dispute between supplier and seller of aircraft liquid crystal displays). Bank of the Ozarks v. Capital Mortgage Corp., Civil Action File No. 1:12-CV-0405-CAP, 2012 WL 13013981 (N.D. Ga. Dec. 20, 2012) (denying lender’s motion to strike affirmative defenses asserted by obligors of secured commercial loans, denying majority of lender’s motion to dismiss obligors’ counterclaims, and denying lender’s motion for protective order). Atlantech, Inc. v. American Panel Corp., Civil Action File No. 11-50076, 2011 WL 2265539 (E.D. Mich. June 8, 2011) and 2011 WL 2078222 (E.D. Mich. May 24, 2011) (quashing deposition and document subpoena served on client’s customer and subsequently denying emergency motion to compel compliance with narrowed, renewed subpoena). Compass Chemical International, LLC v. True North Products, LLC, Civil Action File No. 1:09-CV-3491-RLV-WEJ, 2011 WL 13213914 (N.D. Ga. Feb. 15, 2011) (recommending that $123,835.95 spoliation sanction be assessed against defendant who altered and destroyed relevant evidence after possibility of litigation arose), adopted by district court over defendants’ objections, 2011 WL 13213870 (N.D Ga. Mar. 21, 2011), entered as partial final judgment, 2015 WL 13579166 (N.D. Ga. Mar. 27, 2015).